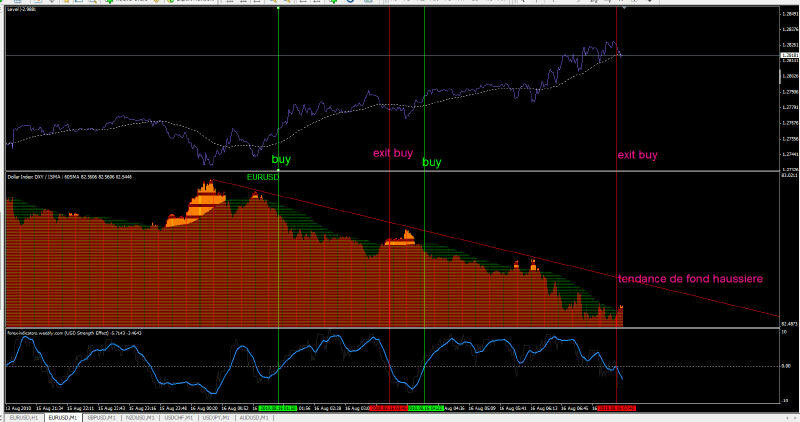 Dollar Index indicator written by Andy Thompson in MQL4 code have more version always written by A.T. I prefer to use the second version.The best way to view the Dollar Index is to use a moving average. When looking at the forex pairs prices it is often tempting to think about counter trend trading during a strong trend. Exponential moving average 3 periods (white dotted line). AscTrend 2 TF two dodge blue bars. To entry when the price retraces into the channel. AscTrend 2 TF two red bars. Re-entry when the price retraces into the channel but this chice is optional. Exit position is discretionary but the best exit is whit profit target 50 pips on the 4h TF and 120 pips on the Daily TF. Initial Stop loss 40 pips. This Trading System is not for beginners.